Brick Town Talk: Recipe for Success - LEGO Town, Architecture, Building Tips, Inspiration Ideas, and more! Paris, France - (BTT) Proving there is more to the fine art of Parisian baking than just croissants and baguettes (as tasty as those may be), La Boulangerie has been whipping up a wide array of confectionery consumables for generations. 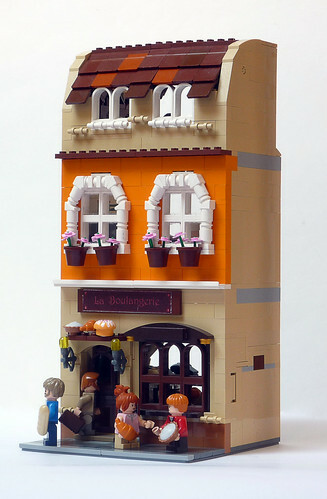 Easily recognizable by its bright orange walls and elegantly trimmed windows, this little bakery plays well with its neighbor - a building which has previously graced these very pages. Awesome orange color in the second story. There's some NPU on the roof using brown chairs, and I like the design of the windows also. The windows are probably my favorite. It's a very classic European looking building.